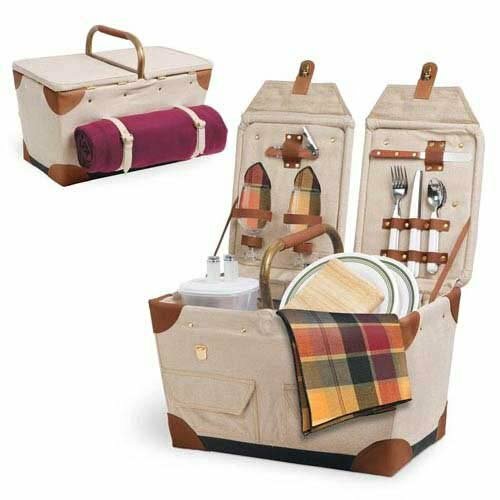 This Picnic Time Pioneer picnic basket was designed with adventurers in mind. Lightweight and durable, this basket features a rattan frame, fully-lined canvas interior, and a genuine leather-wrapped handle for comfort. The Pioneer is equipped with a double lid, two front pockets, and a reinforced water-resistant base. This stylish basket includes all the amenities needed for deluxe picnic service for two, including 2 each: 9-inch melamine plates, 8-ounce hand-blown wine glasses, stainless steel forks, knives and spoons, coordinating 100-percent cotton napkins and a 44-inch square tablecloth, a stainless steel waiter-style corkscrew, 6-inch hardwood cutting board, stainless steel cheese knife with wooden handle, a set of salt and pepper shakers, and a plastic food storage container. Put this all out on the cozy 50-by-60-inch plaid blanket, and you are good to go. This basket makes a great for any occasion.